Your used vehicle could eliminate the barrier of unreliable transportation to secure a job. Donate your vehicle to Goodwill as part of our Wheels to Work program. Wheels to Work is a vehicle donation program, serving the Battle Creek, Calhoun County area, which is designed to provide low-cost, road-worthy transportation to qualified persons for whom reliable transportation is a barrier to employment. Wheels to Work is interested in vehicles that are drivable, in relatively good running order, have no or minor body or panel damage, and in need of minimal amount of repairs to make them reliable, safe and road worthy. Your used vehicle can eliminate the barrier of unreliable transportation to and from work for individuals who want family-sustaining employment and independence. Please contact our Wheels to Work office for more details on donating at (269) 962-9000. Are you in need of a vehicle? Contact our office at (269) 962-9000 to determine which program may put you into your own vehicle. You must have a valid driver’s license to obtain a vehicle. 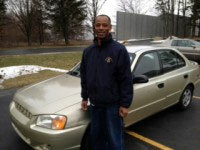 Full time commute made possible by Wheels to Work Army veteran Clifford Carter, 49, obtained his gold Hyundai Accent through Goodwill Industries’ Wheels to Work program in 2009. Carter lives in Battle Creek and works in building maintenance for Medallion Management in Kalamazoo. It’s a job he’s held since April 2011, and trained for in a six-month program – also in Kalamazoo – through the Veteran’s Administration. Neither his training nor his job opportunity would have been feasible without reliable transportation. Carter was referred to Wheels to Work by the Michigan Rehabilitation Services, and took possession of his gold four-door within 60 days of application.